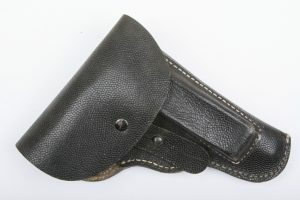 Typical black late war holster for the CZ27 pistol in pebbled leather. Nicely marked on the carrying loop! 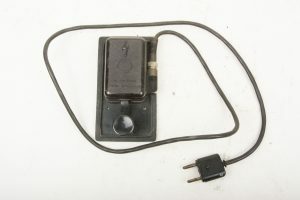 Bakelite Wehrmacht issue morse key for use with radios and field phones. Nice piece in good working condition! 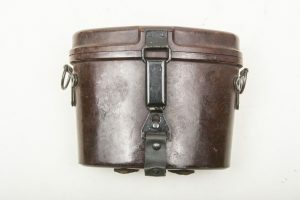 Scarce complete and working Wehrmacht Detonator type 39 or Gluhzundapparat 39. Free to own and the dynamo is in good working condition delivering a 300 volt charge. These will work over a long length of wire. A very nice pioneer handsaw in good used condition made by Marke Steigo. The brown leather scabbard is nicely marked epf indicating production by Königs- u. Bismarckhütte A G’, Huettenwerk Falvahuette in Schwientochlowitz, Kreis Kattowitz. 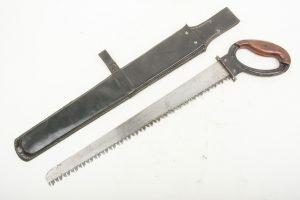 The saw is in good condition with all the teeth intact. The saw still functions great! 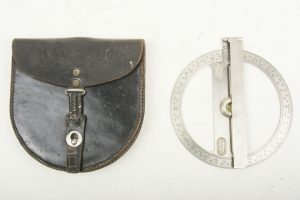 This pioneer saw comes with the textbook leather scabbard dated 1942. The saw would make a awesome addition to a pioneer display and is really in very good condition! A very nice late war M31 Kochgeschirr marked MKL 42. This messkit is interesting because it has a original wartime field repaint as can be often seen on helmets! This maker mark is only scarcely encountered! 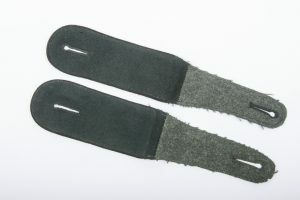 Nice pair of M36 Heer EM shoulderstraps for a Pionier in very good condition. 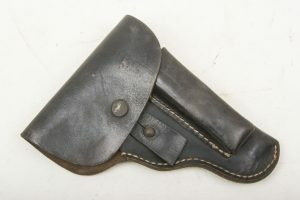 Typical black late war holster for the CZ27 pistol in very good condition. Nicely marked oub inside the flap which is a unknown late war producer. Nice original ET62 single decal M42 Heer helmet in very good condition. 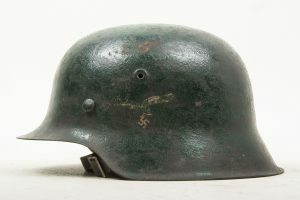 The helmet is a great and typical example of a single decal Heer M42 helmet marked ET62 indicating production by by Eisenhüttenwerke, Thale and has a size 55 liner. The helmet is in complete and untouched condition and would be very hard to upgrade. A simple, untouched single decal M42 helmet in perfect condition. Marked NS64 indicating production by Vereinigte Deutsche Nikelwerke, Schwerte. Inside a minty liner complete with domestamp! I’ll let the pictures do the talking. A very nice 6×30 Dienstglas complete with strap and bakelite rain guard marked ddx indicating production by Voigtlaender u. Sohn AG, Braunschweig. 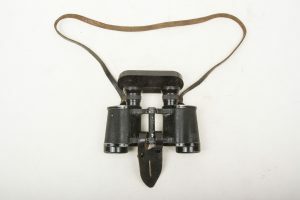 The binoculars are in good clear condition with the rangefinder or Strichplatte still retaining in the right reticle. A nice piece in good condition! Stone mint reversible Splittertarn parka trousers. No damages or holes and most if not all of its originally sewn buttons. Interesting detail is the pocket lining made out of Sumpftarn. Best reversible parka trousers I’ve ever had to offer! A nice matching large tropical canteen marked MN42 indicating production by Metallindustrie GmbH. Neunkirchen-Saar (MENESA). 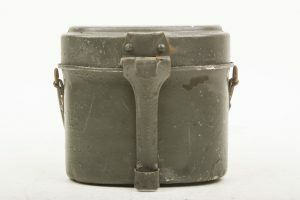 Unique Luftwaffe single decal M42 camouflage Stahlhelm marked ET66 indicating production by Eisenhüttenwerke-Thale. The helmet has a nice large size 66 liner and a shortened chinstrap which is original to the helmet. The helmet retains its original camouflage paint and decal up to 90%. The helmet has a typical dark green camouflage paint that can be found a lot on helmets found in the Netherlands. The dark green camouflage paint has been dabbed onto the helmet and has multiple fingerprints in the paint. The helmet is nicely unit marked and named inside II Flak 21 H. Mackart. 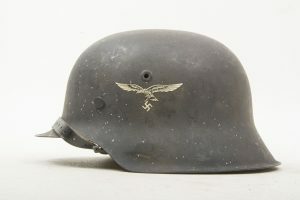 The helmet is a great example of a original camouflage helmet in great condition! 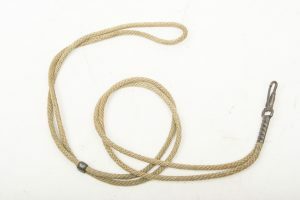 Nice minty original Colt 1911 lanyard in unissued condition. Nice M40 breadbag in good used condition. 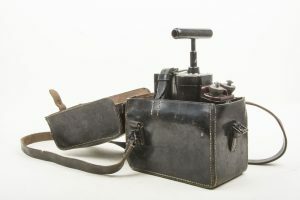 This model was only produced for a short period between the grey pre war model and the model without the belt loop reinforcements. Nice example! A nice complete set marked Gebr. Wichmann m.b.H. 18732. These where used to read angles on maps in a 6400 mills scale. Hard to find, especially with the original leather pouch! 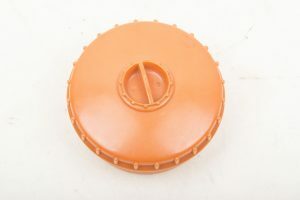 Yellow piped EM/NCO visor cap in great, used condition. 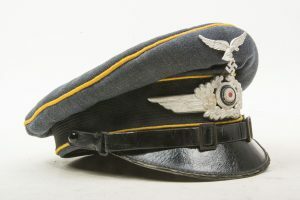 The cap is made by Rahm & Kampmann 1939. The cap is in strong used but untouched condition and retains a lot of patina. A very nice red brown bakelite case for the 6×30 Dienstglas. The case is complete with leather support straps on the back and a grey rubber pull strap. The case is in very good clean condition. Minty mid to late war Luftwaffe breadbag in unissued condition. Nice original MG34 sling in good supple condition. Would easily compliment any MG34. A nice original combat worn and textbook Splittertarn cover. 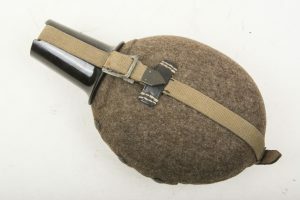 The cover is photographed on a size 64 helmet shell. 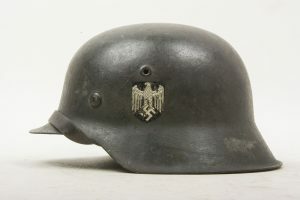 These helmet covers where issued to a lot of different units later in the war but one of the most prominent early adaptors was the Grossdeutschland division. 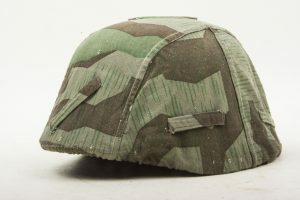 Scarce to find a original Splittertarn helmet cover, especially in good worn condition! Also referred to as a salt dispenser. Nicely dated 1942. A hard to find variant in very good, lightly used condition! 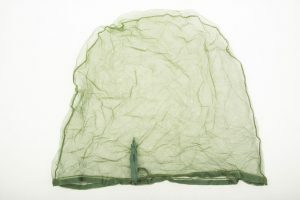 A very nice wartime mosquito net in good condition. It is nicely made in the typical textbook light green colour and large enough to fit over a helmet. Late war Heer M44 field blouse for a Panzergrenadier. The tunic is in good unissued condition with minimal storage wear. The garment retains most of the nap in the wool. All the insignia are factory sewn without alterations. 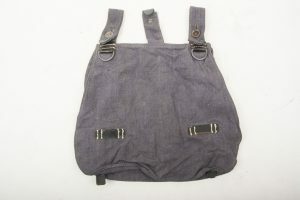 The garment retains all of its originally sewn buttons. The shoulders are adorned with a set of late war EM M43 pattern Panzergrenadier shoulderstraps. The garment is a medium size good for most modern or vintage mannequins. The garment has some storage wear and a few repair but is otherwise a stellar unissued example. Hard to upgrade! 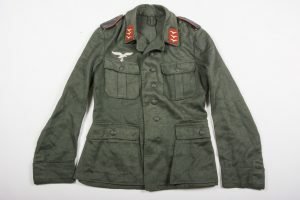 A nice original late war Luftwaffe EM hbt combat tunic. The tunic comes with its original factory sewn breast eagle and machine sewn collar tabs. 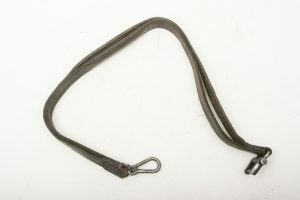 The shoulderstraps are red rayon piped examples for Flak. 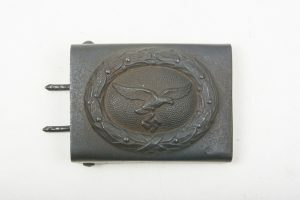 Nice original Luftwaffe belt buckle by Assmann & Sohne. Hard to upgrade original belt buckle! 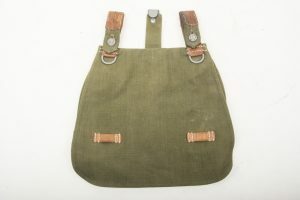 Unique last ditch MG42 tool pouch from captured Italian leather. 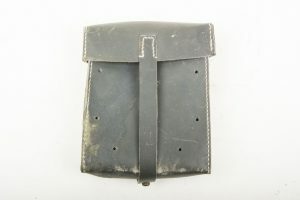 The pouch was made without internal dividers from the factory and issued as such. The pouch is nicely marked bdt 45 indicating production by Salewa, Lederwarenfabrik G.m.b.H., München. Hard to find variant, the second one I’ve ever seen! 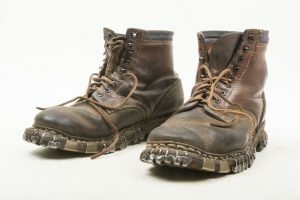 A nice pair of Gebirgsjäger boots in good used condition with a pair of original laces. The size is a nice average size, not too small or big. A nice pair to finish a mannequin with! 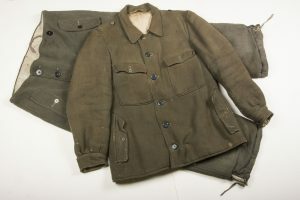 A uniform set consisting of a period modified Waffen-SS Winter Panzer coveralls with a first pattern mouse grey wool Waffen-SS pattern reversible parka trousers. The jacket and trousers are both in equal strong worn condition. 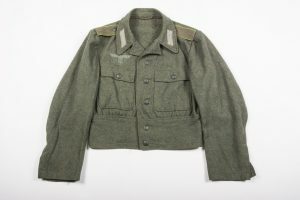 The reversible Waffen-SS winter Panzer coveralls have been shortened below the waist pockets and are in salty condition. They are incredibly rare, as most original Waffen-SS Panzer uniforms. As most Waffen-SS coveralls they are designed for short people. This was most probably worn by someone tall, incapable of wearing the coveralls as is. I believe the set could be put together but I’ve found them as a set and they both show equal wear. The set would be very nice for a early eastern front Waffen-SS Panzer mannequin! 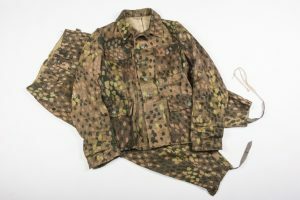 Matching Waffen-SS dot pattern uniform in Erbsentarn camouflage marked Betr. Ra. Outstanding unissued matching M44 dot pattern Waffen-SS Erbsentarnmuster camouflage marked Betr. Ra. The blouse is a nice unissued example with all originally sewn buttons and strong contrasting Erbsentarn colours. Nicely marked Betr. Ra. indicating production by Betriebswerk Ravensbrück (Texled). The jacket has some small holes due to storage through the years. Otherwise its in mint unissued condition! 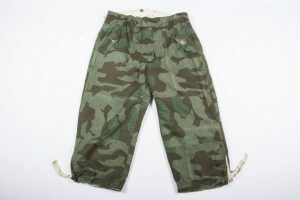 The trousers are in equal condition without holes or wear. One of the leg ties is incomplete. The trousers have all originally sewn buttons. The trousers are also marked Betr. Ra. and match the jacket in pattern and camouflage, they would instantly dress a mannequin! Finding a loose jacket or loose trousers can be done, but finding a minty maker matching set is extremely difficult!